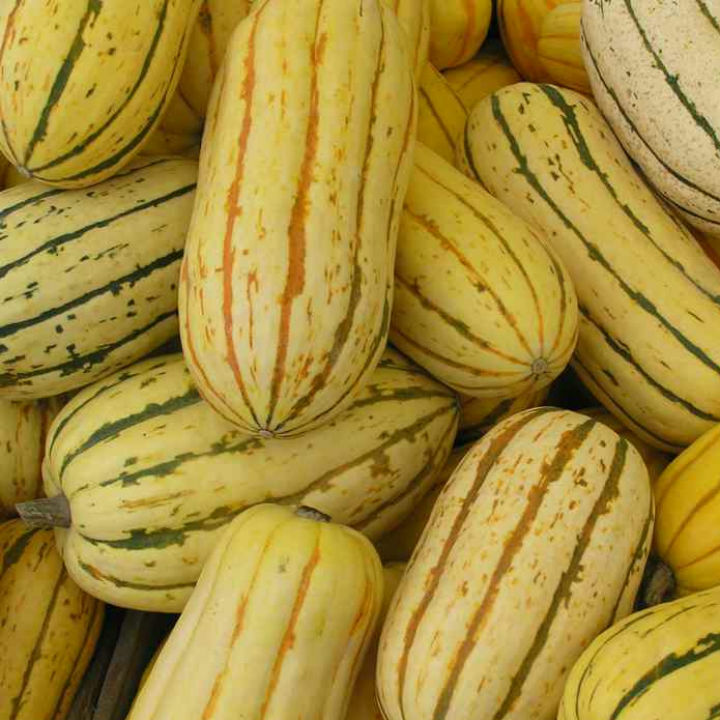 Have you ever heard of delicata squash? Probably not, but you have more than likely seen it in your local supermarket and wondered what it was. Well, I’m here to tell you that it’s a delicious, easy to cook winter squash with flavor much like butternut. It’s usually oval and is characterized by long green stripes on top of a yellow-cream colored flesh. What makes this type of squash unique is its ability to be baked or steamed easily and quickly with the skin still on. So instead of spending time fiddling with pesky vegetable peelers, you can just cut it up and start cooking. Delicata squash can be microwaved, sauteed, or roasted in a pan which caramelizes the squash and brings out an intense rich, creamy flavor. It’s seeds are also edible and can be roasted in the oven much like pumpkin seeds. While this squash itself can be cooked unpeeled, some do prefer to eat it without the skin. If you’re one of these people, follow these four simple steps to learn how to peel, seed, and cut your delicata squash. Use a vegetable peeler, potato peeler, or knife to take the skin off of the outside of the squash. Cut the delicata in half lengthwise. Use a spoon to scoop out the seeds left in the middle of each half and either save them for roasting later or discard them. Cut each half in half again lengthwise and then horizontally forming small, half moon shapes. Next time you’re walking through your local grocery store and see delicata squash, make sure to pick one up. Whether it’s eaten on its own, prepared as a delicious side, or thrown into your next recipe, delicata squash will not disappoint.